There are currently two Native American representatives in the House — both men. Deb Haaland had her eye on the history books and with Sharice Davids in Kansas, ABC News projects, based on exit polls, that the two will be the first Native American women in Congress. “In 230 years, there’s never been a Native American woman in Congress. I have never seen myself in that body of our government,” Haaland said in an interview in June with ABC News. In Kansas, Davids challenged incumbent Republican Rep. Kevin Yoder. In September, Haaland and Davids appeared together at a rally in Kansas City, Kansas. There are currently two Native American representatives in the House — both men from Oklahoma. (Brian Snyder/Reuters) Democratic Congressional candidate Deb Haaland hugs a supporter after winning her midterm election in Albuquerque, New Mexico, Nov. 6, 2018. 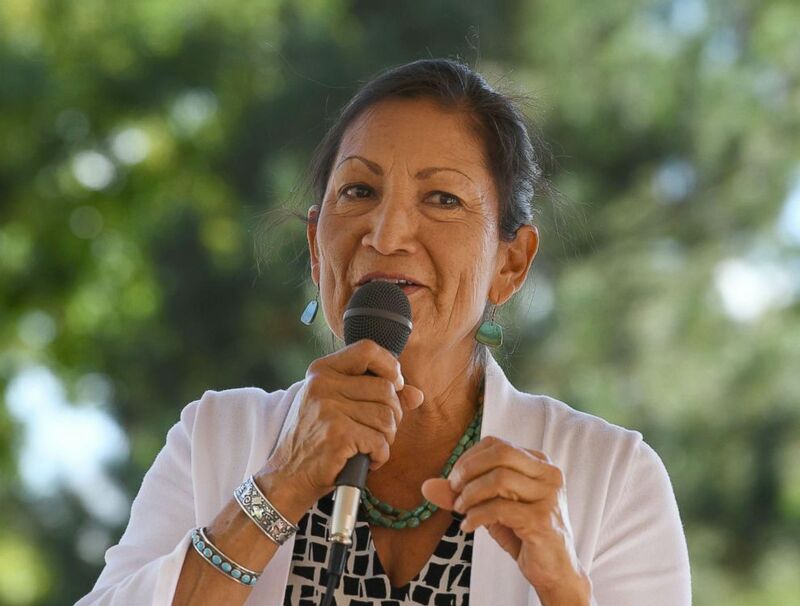 Haaland, an enrolled member of the Pueblo of Laguna, a federally-recognized Native American tribe, won the Democratic nomination in New Mexico's 1st Congressional District, coming out on top of a crowded field of candidates. Among the five Democrats vying to fill incumbent Democratic Rep. Michelle Lujan Grisham’s seat, two of Haaland’s opponents raised the most money and were seen as frontrunners. Grisham is running for governor. The former chair of New Mexico’s Democratic party was born in Winslow, Arizona. Her father served in the Marines and her mother served in the Navy and because of their military service, her family moved several times. (Mark Ralston/AFP/Getty Images) Native American candidate Deb Haaland who is running for Congress in New Mexico's 1st congressional district seat for the upcoming mid-term elections, speaks in Albuquerque, New Mexico, Oct. 1, 2018. In 1994, she earned an English degree from the University of New Mexico and later graduated from the University of Mexico School of Law. While studying in New Mexico, she served as the tribal administrator for the San Felipe Pueblo governor’s office. She volunteered full-time as a Native American vote director for former President Barack Obama’s 2008 and 2012 campaigns. In 2014, she ran unsuccessfully for lieutenant governor. “Ten years ago, when I was out in Indian country knocking on doors and driving folks to the polls, I never thought I would run for Congress,” Haaland said. ABC News partner FiveThirtyEight forecasted the district as “solid Democrat” and said Haaland had a 79 in 80 chance of winning the seat over former Republican state Rep. Janice Arnold-Jones. ABC News' Cheyenne Haslett contributed to this report.